Dave Brubeck has received a posthumous Grammy Award nomination in the best instrumental composition category for a symphonic piece inspired by Ansel Adams' iconic black-and-white photographs. 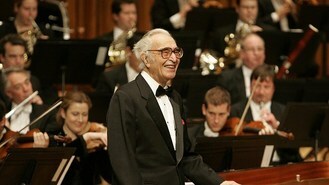 Brubeck and his son, Chris, were nominated for Music of Ansel Adams: America, performed by the Temple University Symphony Orchestra. The announcement came hours after the legendary jazz pianist and composer died at age 91 in Norwalk, Connecticut. Brubeck initially composed the 22-minute work as a piano piece and it was transformed by his son into a full orchestral score. It was released earlier this year as an EP. Brubeck received a Grammy Lifetime Achievement Award in 1996, but has never won a Grammy in a regular category. The Grammys take place on February 10 in Los Angeles.